With half a decade of development and nothing to show for it, the long-awaited Gears of War movie is searching for a new home. After five years of development, numerous setbacks, and multiple screenplay drafts, the Gears of War film is once again returning to the land of the living. Creative Artists Agency -Â which represents Epic Games and the Gears namesake - is now actively looking for a producer for the film. New Line has had the project in development since 2007, but placed it on hold in order to give Peter Jackson's Hobbit franchise its full attention. It seems that the wait has simply been too much for CAA, and the agency now hopes to revive the project somewhere else. The Gears flick has had a rather bumpy ride since it was first conceived over half a decade ago. Live Free or Die Hard director Len Wiseman was at the helm of the project from 2008 until 2010, at which point it is rumored that Top Gun director Tony Scott considered taking on directorial duties. Scott committed suicide this past August. The most recent version of the screenplay was written by Stuart Beattie. Beattie is best known for his writing credits on the Pirates of the Caribbean films, including the upcoming sixth iteration of the franchise. He also happens to be represented by CAA, the same agency in charge of finding the Gears movie a new home. 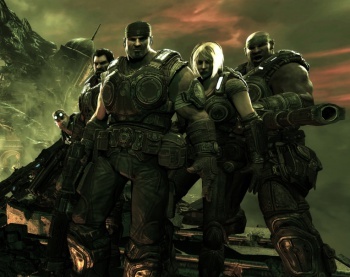 Gears of War: Judgement - the fourth title in the series - is slated for release in March of next year, and interest in the Gears universe will likely once again be at a peak. If a new home can quickly be found for the film, it seems like a perfect time to begin drumming up some good hype, but given the history of the project, that's a very big "if."